Saint Mary’s will host the 23rd annual Hypatia Day this Saturday, a day for middle school girls to be inspired by the realms of math and science. Saint Mary’s will host the 23rd annual Hypatia Day this Saturday for seventh grade girls from local South Bend schools to fight the stereotype that math and science are male-dominated fields. With the assistance of current students, professors and high school students, the day will be centered around exposing both young girls and their parents to the many opportunities available in the STEM (Science, Technology, Engineering and Mathematics) fields for women. Hypatia Day was first organized in 1991 by Sr. Miriam Patrick Cooney, professor emerita of mathematics, director of media relations Gwen O’Brien said. Hypatia Day is named for the first known female mathematician, Hypatia of Alexandria, who was the daughter of ancient Greek mathematician and philosopher Theon, O’Brien said. According to legend, Hypatia’s father taught her mathematics during a period in Greek history when young girls were excluded from education. According to Socrates, Hypatia’s home and lecture room were the two favorite gathering places for her scholarly friends, as she was one of the most-loved teachers and well-respected scholars of her time. Assistant professor of mathematics Kristin Kuter said Hypatia Day is mainly geared towards seventh grade girls and their parents. Some of the participating schools include Indiana schools such as Boston Middle School in La Porte, Discovery Middle School in Granger, Grissom Middle School in Mishawaka, Lincoln Jr. High in Plymouth, New Prairie Middle School in New Carlisle and St. Joseph Grade School in South Bend. “The focus of the event is to encourage the seventh graders to continue to pursue an education in math and science, while informing their parents on how to support their daughters in that goal,” Kuter said. Kuter said this year’s Hypatia Day will feature hands-on activities run by STEM-related clubs on campus. Beginning at 8:30 a.m. on Saturday, students and their parents will arrive in Carroll Auditorium for a welcome presentation by Kuter. Then, director of patient logistics at University of Chicago Medicine Emily Lowder will deliver the keynote address, “Following Their Footsteps and Tales from the Journey” to all participants. Kuter said throughout the day, middle school students will have the opportunity to work in the lab with college and high school students who are preparing for a future in the STEM fields. Kuter said parents will also be able to speak with Saint Mary’s students about their future careers, attend panel discussions and take part in campus tours. “The parents attend a panel discussion focusing on what curriculum best prepares a student for college and keeps all of her options open. Another session will provide information on financial preparation for a college education,” she said. Kuter said she believes Hypatia Day is important not only for young girls at their current age, but for the growth of their interest in the subjects over time. “This event is important to the community because research has shown that girls of this age greatly benefit from extra attention and encouragement for their interest in studies which require a high degree of training in mathematics and science,” Kuter said. Senior Audrey Kiefer said she believes Hypatia Day to be one of the best ways Saint Mary’s can engage with the local community. 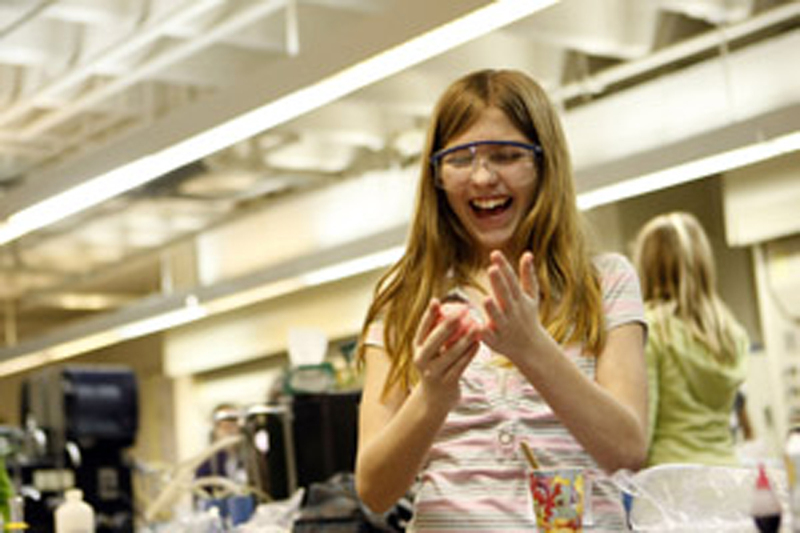 “Though I haven’t participated in the day personally, I know some of my fellow classmates who are science majors always say that the young girls truly appreciate the opportunity to experiment in the labs and make connections with college students,” Kiefer said. Kiefer said she finds it essential to begin empowering young women at an early age in the same way that Saint Mary’s empowers women throughout their collegiate years. “When all of [the current students] find Saint Mary’s to be such a great place for expanding our minds and planning to make a difference, it only makes sense that we host a day like this to show young girls that anything is possible, no matter what field of study,” Kiefer said.